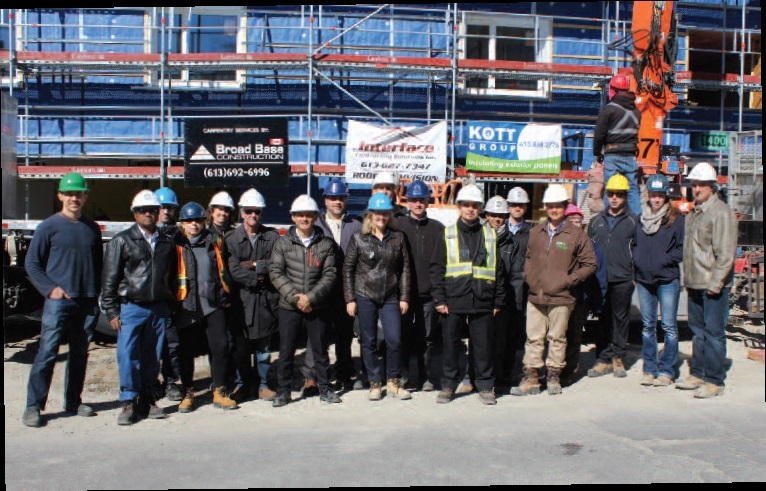 Members of the Greater Ottawa Home Builders’ Association’s (GOHBA) innovation committee toured, in late April, the first multiunit affordable housing project in the world to be built to Passive House standards in a northern climate, and discovered a project that is successfully transcending conventional construction and social housing taboos. Ottawa Salus Corporation executive director Lisa Ker says the 42-unit structure on Clementine Blvd. designed to house individuals with severe mental illnesses in their own independent apartments, has construction costs of about $7.5 million, about 10 per cent greater than a conventionally built affordable housing project. However, the building has been designed to consume at least 80 per cent less energy than the building code standard – and its durability will hopefully extend beyond conventional affordable housing projects, Ker said. The project is nearing its final construction stages, as tradespeople install interior finishes, plumbing and services. Additional costs were incurred to import building materials – especially for the building envelope – but there are savings in the mechanical systems, maintenance and ongoing energy consumption. 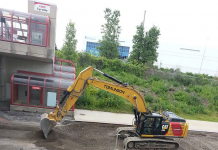 Ker and Assal, the project’s general contractor, said they have received much cooperation and support from City of Ottawa, including its building inspectors, who have asked to participate in the project’s planning meetings. 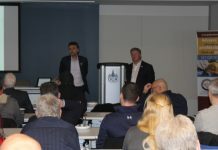 Tradespeople have also invested additional time in learning how the Passive House systems work, although they have still bid their work competitively, Assal said. Salus observes its own environmental principals. Many employees of the 110-staff organization get around by public transportation and bicycle. (In fact, Ker took a city bus to attend the April tour.) She said the building design was modified slightly to allow for a lay-by so visitors, including staff, could park briefly when they are picking up tenants for appointments. Ker says she believes that the economics of Passive House construction can only improve, as supplies become available and the learning curve in installing the different services is reduced. The building was designed by CSV architects. Sonia Zouari, president of the Ottawa Construction Specifications Canada (CSC) chapter, served as project architect.